The responses to La La Land (Damien Chazelle, 2016) have been predictable. There is the immediate majority, those of us who are completely enamored of its loving recreation of classical Hollywood films, such as Singin’ in the Rain (Gene Kelly and Stanley Donen, 1952), celebrations of the power of American cinema (see Rosie Fletcher on Casablanca as an example). 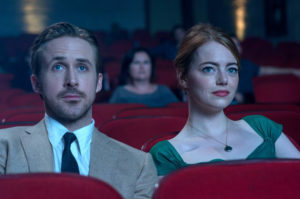 And, then, of course, slowly trickle in the cynics who begin to rightfully pick the film apart for its gender assumptions; for the limited skills of its stars, Ryan Gosling and Emma Stone as singers and dancers; and for the film’s ideological investment in classical Hollywood values (i.e., Imran Siddiquee’s “Donald Trump in La La Land”). What’s important about criticism is precisely this wonderful debate: while both positions are viable, the many possibilities in between are what will keep us enjoying, and talking about, and fretting over La La Land for decades to come. The question is not the one thing that La La Land can be reduced to, but what many things criticism can allow it to become. That process rightfully takes centuries, as the post-Freudians’ psychoanalytic reconstruction of William Shakespeare’s Hamlet (1603) amply demonstrates. In film history, who could have predicted that Salman Rushdie would irreparably expand our understanding of The Wizard of Oz (Victor Fleming, 1939), linking Dorothy’s experience to post-colonial theory an astonishing sixty-nine years after the film’s release? I offer the following observations as a roadmap for considering the possibilities of what La La Land can become as we respond to it using different methods, building what cultural studies scholar Tony Bennett describes as “encrustations” around the coral reef that is this beautiful, and trickily complex film. La La Land is an intertextual treasure trove. 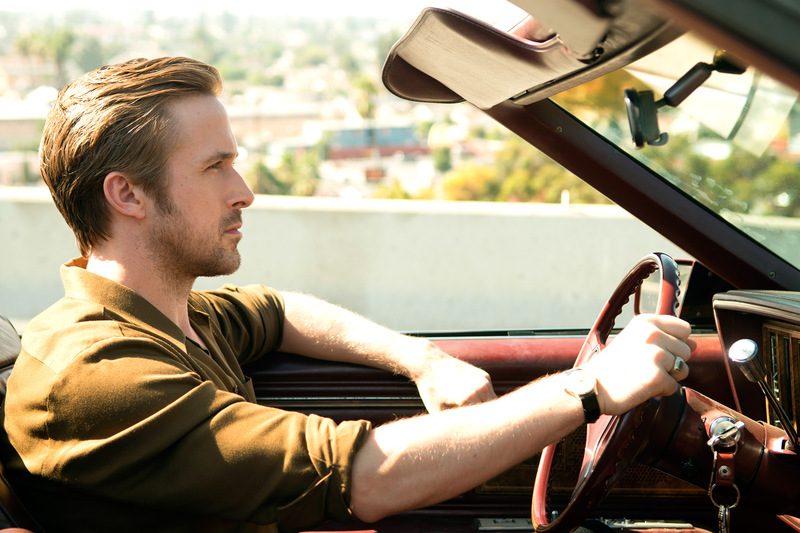 The film begins with an energetic yet noticeably bland musical number, “Another Day of Sun.” On a bright, sunny day, Mia (Emma Stone) and Sebastian (Ryan Gosling) are stuck in traffic. This is the central contradiction of Los Angeles: within less than an hour of one of the greatest metropolises in the world lies both glorious Pacific Ocean beaches and snowy mountaintops, yet no one can get to any of them in a timely fashion because far too many people driving alone in cars populate a valley designed by nature for growing oranges. 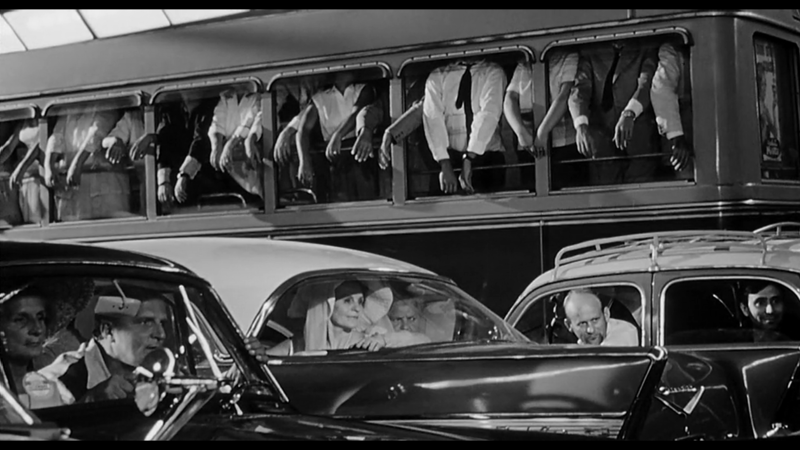 The sequence invokes the opening of Federico Fellini’s 8 ½ (1963), in which exhausted filmmaker, Guido Anselmi (Marcello Mastroianni) sits stuck in traffic in Rome. As smoke pours into his car, he engages in a reverie in which a gust of wind lofts him into the air over the city, taking flight toward the ocean. 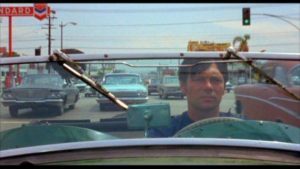 Chazelle uses this opening motif of vehicular suffocation for completely different purposes. No longer is the central character isolated. While the other human beings in 8 ½ merely stare at Guido’s Existential suffering, forcing him to take flight, if only in his mind, to escape them, in La La Land, the two suffering artists sitting in their cars are surrounded by dancers who convert the paved surface of the highway into a dance floor. Freedom driven by the human body (as expressed in the American musical), and not the Surrealist, dreaming human mind, is what the Hollywood film, La La Land proposes in riposte to Fellini’s art cinema. And yet, the giddy musical virtually disappears from La La Land for much of the rest of its remaining two hours. One possibility is that La La Land is a deconstruction of a musical more than it is the conventional stuff grounded on the Broadway stage. Like Chazelle’s first feature, Whiplash (2014), which is more a film about abuse than it is about music, La La Land is obsessed with the tension between artistry and life. While Sebastian is a jazz pianist, one of his primary roles is to talk with Mia about why she shouldn’t hate jazz. Similarly, Mia is an aspiring actress, yet we see little of her acting, and her early auditions are for terrible television shows, to boot. When she becomes successful, La La Land chooses to represent her purchase of coffee on the studio lot rather than bothering to tell us what kind of actress she has become. 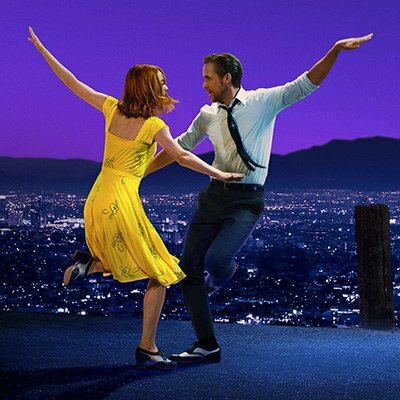 While there are minor dancing numbers interspersed throughout the rest of the film—Mia dancing in the street with her friends, all draped in bright colored dresses—La La Land is a minimalist musical, built around a mere three great numbers, each suspiciously placed in the three acts of the film’s narrative, and like “Another Day of Sun,” pinned to international art cinema intertexts. After beginning with such awe inspiring, one-take virtuosity, the next great musical set-piece occurs right after the first turning point. Late in Act I of La La Land, Sebastian takes Mia to the dilapidated Rialto Theater to see Rebel Without a Cause (Nicholas Ray, 1955). This very theater–closed to showing films because of a lack of attendance, and apparently with a projector that destroys 35mm film–will become the site of what appears to be the ending, rather than the beginning, of Mia’s career. She performs a one-woman show, “So Long Boulder City,” to virtually no audience members, save the casting director who will provide Mia with her big break much later in the film. Most importantly, Sebastian is not there, having been forced into a photo shoot by virtue of having signed a contract with a commercial band. 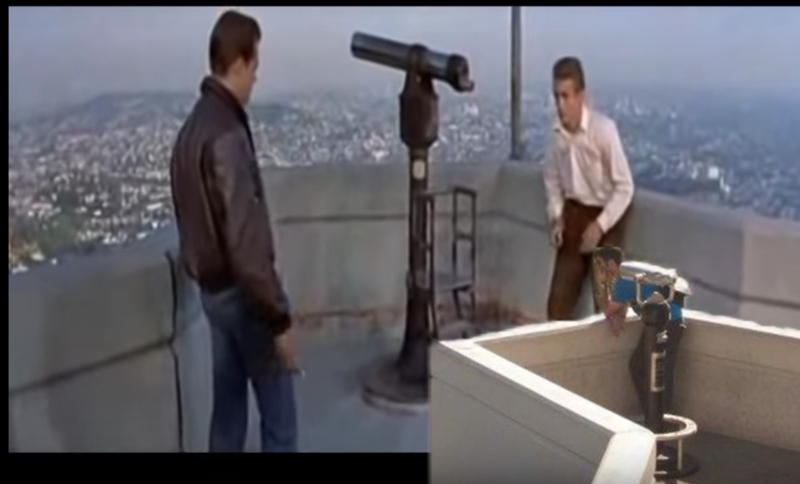 Sebastian brings Mia to Rebel Without a Cause because she pretends to have seen the film, but he’s astonished to find out she has not. It is worrisome that La La Land so easily falls into the Annie Hall–Tootsie syndrome, films in which men must teach women all sorts of things, to read philosophy instead of cat books in the former, how to be better women in the latter. At any rate, while watching Rebel Without a Cause, the film suddenly catches in the gate, and burns. Mia has an alternative idea to watching old movies: she takes Sebastian to the planetarium at Griffith Park, inspired by the scene in the film they’ve just witnessed, luckily a moment placed by Nicholas Ray early in its first act: high school student, Jim (James Dean) is taken by his teachers to oddly learn about the death of the Earth’s sun, a cause for Existential despair among the moody teenagers. The burning of Rebel Without a Cause in La La Land could be merely a plot device. However, given Chazelle’s art cinema inclinations throughout the film, the spectre of Persona (1966) also lurks in the shadows. In Ingmar Bergman’s masterpiece, Elisabet (Liv Ullmann) steps on a shard of glass left by her nurse Alma (Bib Andersson), a punishment for the actress’ cold study of Alma’s suffering for the purposes of her art. Film scholars have suspected Persona is about one woman, with Elisabet and Alma dissolving into one another, with one entering and the other exiting the frame with suspicious precision. Chazelle’s invocation of Bergman’s film burning gimmick spirals La La Land in a new direction. Narratively, it inaugurates the film’s second act: Sebastian and Mia take flight inside the planetarium, dancing in a partnered reprise of Guido’s floating at the beginning of 8 ½. 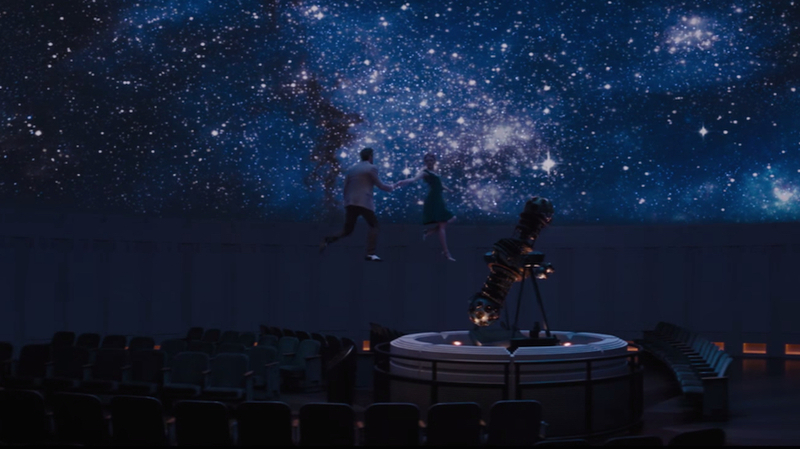 Yet, something else has transpired: like the death of the sun in Rebel Without a Cause, the levitated dancing number brings about an end to La La Land’s giddy optimism, most prominent in the very opening musical number of the film. The film’s signature song, “City of Stars,” written by Sebastian to mark his love for Mia, becomes more and more a funeral dirge than anything else, sometimes barely played beyond just a few melancholy notes tapped out on the piano. Furthermore, if Persona is a film that uses two actresses to play a single woman, one of whom is suspiciously an actress herself, I suspect something equally complex could be going on in La La Land. What if Chazelle’s film, against all tradition in the classical Hollywood musical (about communal dance numbers) turns out to be about only one person? As is typical of musical romances, La La Land has a conventional narrative structure, of boy meeting girl but hating her, boy falling in love with girl, and then losing her. But Sebastian and Mia also represent stark oppositions: Sebastian voices the revolutionary aspect of the artist, self-destructive, monolithic, committed to a pure, traditional form of jazz that is commercially unviable. For her part, Mia represents opportunism, concerned with becoming a star, driven less by craft and art than by a shallow sense of success. All of this, of course, is leading toward an analysis of the film’s ending, one of the most complex magic tricks in recent memory. The entire film, we come to learn only in retrospect, pivots around the moment that Mia and Sebastian meet. He has just been fired his boss (played by no accident by Whiplash star, J.K. Simmons) for failing to play the set of bland Christmas music he’s been assigned. Sebastian smashes shoulder first into Mia, as he storms out of the club. The film’s ending sequence returns to this moment: this time, Mia and Sebastian, out of some heavenly destiny, embrace and passionately kiss. Rather than the bland life Mia seems to have settled for after her break-up with Sebastian, we now see an alternative one, seemingly demanded by the traditions of the Hollywood musical. The two competing, alternative endings of La La Land are set up by its third great musical number, a direct address performance into the camera by Mia at an audition that Sebastian has forced her to attend. Mia stands exposed and alone, as she has done repeatedly before, attempting to break into the film industry. A female casting director asks Mia to tell a story. Mia begins talking autobiographically, but then breaks into song, “The Fools Who Dream,” a moment that surely must win Emma Stone the Academy Award, and should win an Oscar for Best Song, assuming that “City of Stars” does not divide attention away from it. It is as moving a celebration of the creative impulse as anything in a Pixar film, which is saying quite a lot. Like the film burning to inaugurate Act II, the audition serves as the second turning point which leads to Act III, set five years after the break-up with Sebastian. Mia has married a different man, remarkably bland and uninteresting, and has a young child. She is a successful actress who now buys coffee on the movie studio lot, a shop where Mia used to work serving the coffee to successful actresses. This ending, where Mia ends up with the wrong man, devastates us as we sit in the movie theater. And, it represents Chazelle’s intertextual coup. This bitter ending most invokes one of the great non-Hollywood musicals in film history, The Umbrellas of Cherbourg (1964). La La Land is an inversion of Jacques Demy’s hyper-musical, in which every line of dialogue is sung. While compared to the mainstream Hollywood musicals that La La Land invokes (the dream sequence at the end is, of course, a reconstruction of An American in Paris [Vincente Minnelli, 1951]), Chazelle’s film has too little music and dancing, while The Umbrellas of Cherbourg has “too much” singing. 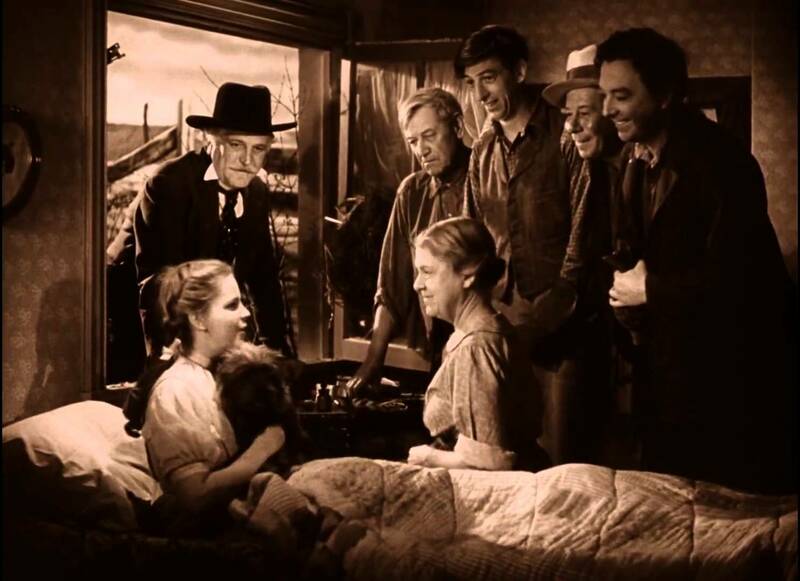 Demy’s film ends with one of the most heart-wrenching scenes in any film, never mind a musical. 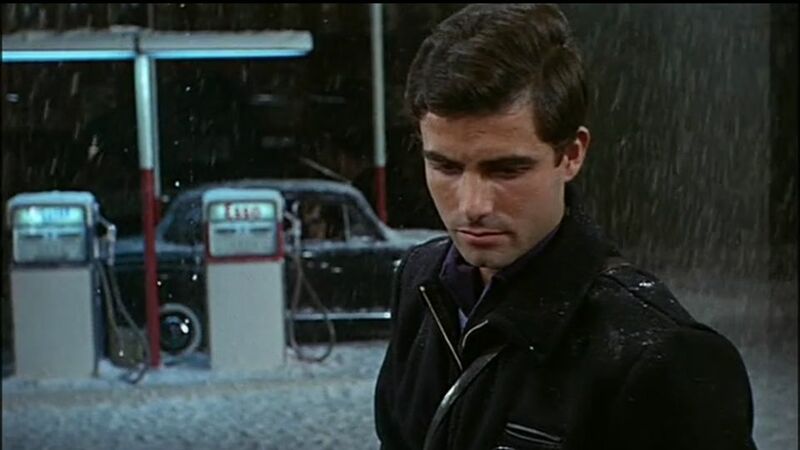 Six years after central protagonist, Guy (Nino Castelnuovo) leaves his lover, Genevieve (Catherine Deneuve) to go fight in the war in Algeria, he has returned home; he now owns a gas station and lives there with his wife and son. On Christmas Eve, the now wealthy Genevieve arrives with her daughter (fathered by Guy long ago) to get gas for her car. Set to a haunting melodic score by Michel Legrand, The Umbrellas of Cherbourg ends with the lovers, who we so clearly believed to be fated for each other, parting silently. After all of that singing earlier in the film, we are left with virtually unendurable suffering, while ironically the characters have established perfectly wonderful lives with other people, with whom we have absolutely no investment whatsoever. The Umbrellas of Cherbourg represents a middle-ground position between the modernism of the French New Wave (challenging films like Jean-Luc Godard’s Contempt ) and the grandiose happy-ending films of the early New Hollywood, such as the most successful, The Sound of Music (Robert Wise, 1965). In its wild intertextual reworking of films from both of those traditions, La La Land follows directly in Demy’s footsteps. As I hope to have demonstrated, La La Land’s sprawling nature means that it cannot possibly be one thing alone; instead, it is a chameleon film, one that by necessity transforms depending upon which method one uses as a motor for making sense of it. For one thing, in addition to being a musical in the tradition of The Umbrellas of Cherbourg, La La Land is also an exquisite film about Los Angeles. By no accident, that is the path also followed by Jacques Demy. On the heels of the grandiose achievement of The Umbrellas of Cherbourg, Demy followed the journey of many filmmakers, from Sergei Eisenstein to F. W. Murnau, who came to Hollywood to transform it, only to be discarded. Alas, Demy suffered in the way that many such European emigres did, in his case making one of the great films about Los Angeles, Model Shop (1969), but a film that never found an audience precisely because it so explicitly captured the hollowness of life in Los Angeles. This failure will clearly not be the fate of La La Land. While Demy chose to follow his middle-ground success in The Umbrellas of Cherbourg with a sullen art film about the horrors of America, Chazelle moved away from his Existential film about the pain of being an artist, Whiplash. La La Land discards the bleakness of independent cinema for the big budget Hollywood musical, and not merely as a commercial co-optation. Chazelle’s film is an oddly quiet meditation about the nature of art. Indeed, if the thematic logic of Persona holds, Chazelle’s film suggests that the artist is forever caught in between the commercial success of Mia and the creative integrity of Sebastian. 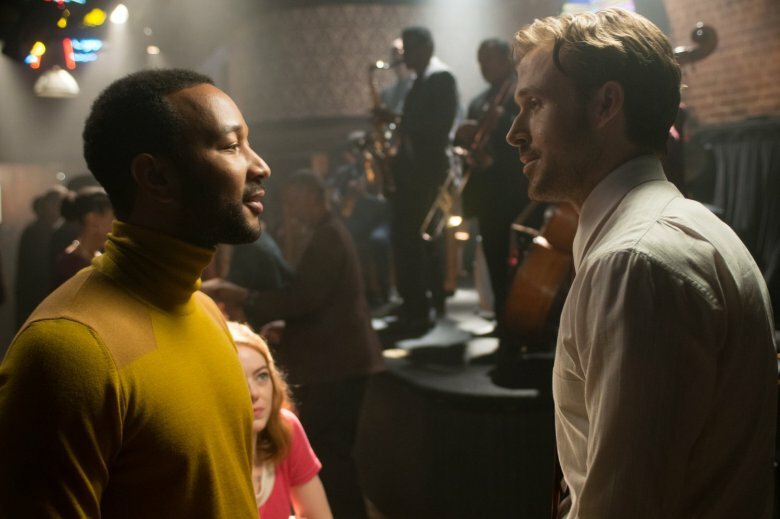 Just when we think La La Land has devolved into wallowing in a Hollywood happy ending (with the suggestion that the pessimistic ending of The Umbrellas of Cherbourg has been completely overridden by Mia and Sebastian’s glorious alternative life of happiness together), Chazelle for a second time pulls the rug out from under us. Mia indeed is married to the other guy. They pull off the highway traffic jam that echoes the opening of the film, now at night, mimicking the snowy ending of Demy’s film that so clearly contrasts with the warmer rain of the rest of that film. Mia and her new husband enter Sebastian’s nightclub, where he sits down to play the piano. With only a few notes from “City of Stars,” we are devastated. Chazelle accomplishes what I could not have imagined possible: he recreates the emotionally crippling power of the ending of The Umbrellas of Cherbourg. Mia begins to leave the club with her husband. She turns back while standing at the door. She smiles at him. Sebastian in turn merely nods, with enviable self-understanding. As in The Umbrellas of Cherbourg, the two ex-lovers have come to terms with the nature of art and life. Mia and Sebastian cannot possibly have attended to each other while pursuing success as artists as a couple. That which we in the audience so desperately demand, that passionate kiss of inevitability between Mia and Sebastian that the Hollywood film seems to require, is only a fantasy of ours, not a viable life strategy. I began with The Wizard of Oz because its status as the epitome of the successful Hollywood musical allows us to fully appreciate one of the things that La La Land can become, if we keep throwing methods at its surface. In Chazelle’s dream ending, he chooses a two-dimensional pencil cartoon in profile to replicate Mia’s successful audition at which she takes the ultimate risk and sings “The Fools Who Dream.” The shattering of the film’s aesthetic style into intertextual shards returns us to Persona, which famously begins with an experimental film short composed out of modernist tricks (a close-up on an arc-lamp within a movie projector) and references to the history of cinema (a silent slapstick film comedy). Chazelle’s kaleidoscope of aesthetic practices is up to the task: La La Land’s alternative black-and-white depiction of Mia’s triumph provides a minimalist presentation of Sebastian sitting outside the audition room on the left panel of the cartoon, while Mia sings inside the small room on the left, standing before the two seated casting directors, only to break into the left panel and hug Sebastian excitedly after her triumph. It is an image unlike anything else in the film, standing out from the narrative as boldly as any of the bizarre images in Persona. The aesthetic shift in La La Land is yet another inversion, of the iconic Hollywood musical, The Wizard of Oz. Dorothy’s dream of escaping dreary black-and-white Kansas is voiced by her first musical number, “Over the Rainbow,” while “The Fools Who Dream” is ironically Mia’s last. The majority of The Wizard of Oz is a celebration of the Hollywood musical soundstage, the high-gloss Technicolor used to represent the Land of Oz. Oddly, while the rest of America suffered through the Great Depression while Judy Garland played on an MGM soundstage, Dorothy upon first landing in Oz demands to go back to Kansas. For The Wizard of Oz, the dream turns out not to be a minor moment at the end of the film, as it is in La La Land, but the majority of the film, fulfilling the demands of its spectators more than its characters. The Wizard of Oz is an early filmic example of the biggest lie in the cinema, that all that we have invested in for the past two hours is “merely” a dream, as if all films are not merely dreams. By inverting this cheat ending, La La Land leads us to consider something far more interesting than whether endings like that of The Wizard of Oz are cop-outs. While Dorothy is clearly correct, that she can only belong in Kansas, that “there is no place like home,” the tremendous power of art is that while we must settle for this in our pedestrian lives, the magic of the movies gives us a dream that will last a lifetime, the precious gift that is La La Land. Bennett, Tony. Bond and Beyond: The Political Career of a Popular Hero. London and New York: Routledge. 1987. Rushdie, Salman. The Wizard of Oz. London: BFI, 2008.